Beck Song Information - "Rollins Power Sauce"
God, my throat muscles are completely shredded! Beating on you! No defenses! Now when I want you out! Where the blood is ???! And I got no focus! "Rollins Power Sauce" is a nasty noisy punk track in the mold of Henry Rollins, presumably. Beck shouts the lyrics over some feedback and drums, before tossing the mike to the ground (you can hear it land with a thud). Rollins is famous for shouting his punk poetry, and while this isn't a literal impersonation, it's more of a tribute impersonation. Beck once again does well matching lyrics with music. 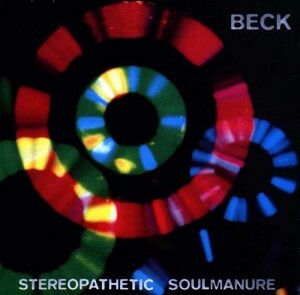 On October 24 1994, after a particularly explosive version of "Truckdrivin Neighbors Downstairs," Beck informs the audience, "I had to pump up to do that one. Out in the alley, I drank a couple of quarts of Rollins Power Sauce."